This successful annual vascular access course is aimed at operators wishing to improve their knowledge of transradial and transfemoral access for coronary angiography. The focus is on safe vascular access site practice with detailed discussions around case presentations including 'tips and tricks' from experienced operators, and with full audience participation in these discussions at all times. 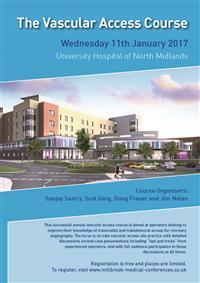 Organised by: Dr Sanjay Sastry, Dr Scot Garg, Dr Doug Fraser and Prof Jim Nolan.